What do the words those agility people mean? This is the BadDog version! The serpentine is a manoeuvre that requires the dog to perform a row of 3 or more obstacles in a squiggly or S-shaped pattern where the obstacles are at about 180 degrees to each other. Here are a few links to website that describe them further. 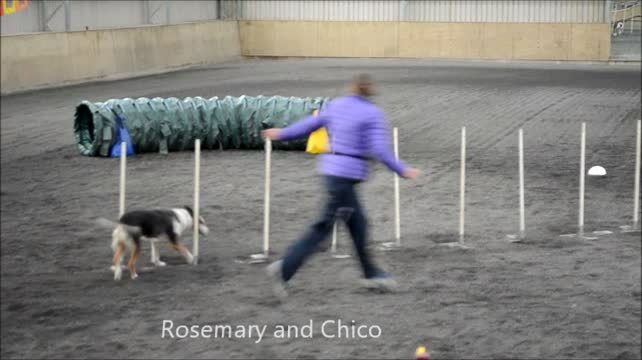 Better front crosses - from BAD DOG AGILITY. Click here to watch the video. This link includes written instructions, pictures and video, so is well worth a look! Showing good placement of the cross and referring to “lead changes” and illustrating nicely the dog spinning and going wide when the information comes late cf early information before the dog jumps. Nicely shows the line to run when performing a rear cross. This is a link to the 2x2 weave method of training. Thetre are many ways you can teach dogs to weave, this is one that is also easy to practice at home. The lady throws her toy quite a long way, you dont need to throw it that far to get the same effect! Tips for motivating your agility dog. Tips include mainly using tricvks and fun activities as well as being aware of how your body language, motion and tone of voice can affecrt how much fun your dog has! See below for the various facets of dog agility that we train, and what we train at the different levels. Week 5: Pull-Thrus/run with me/Side/Here-here! Week 8: German, K-turns, Japanese. Some weave pole drills from Bad dog agility. This is a great article which includes video of backing up. The "box" used here is a mat which looks like the padded mats you get for gardening to save your knees, great idea!! To move dog from the end of one exercise to the start of another. It also includes nice example of the box on Aframe (Rachael Saunders method of running Aframes). 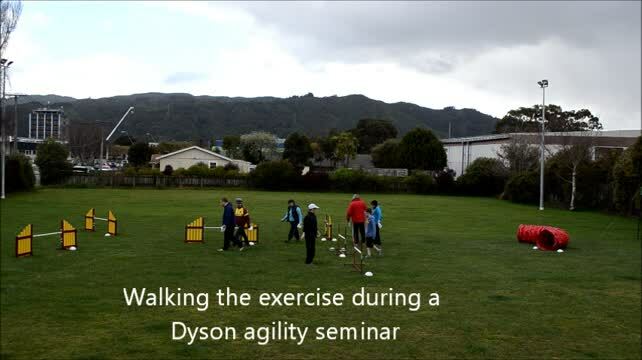 A short video clip showing some of what club members did at the recent Agility training seminar with Dyson Beasley. This is a great video clip showing foundation work for pups and beginners. Topics covered in the short clip include; tugging, waits, collar grabs/hands, balance work, Handling on the ground, Shaping a cone, Foundation games include: go round wing, handling exercises/crosses, send to tunnel, figure of 8s -go round wing/round me, Wing course.